Last month we went to Prague. It was a lovely trip and I will be sharing the pictures on the blog soon. While we were away Ted and Callie went to stay with Joe's parents and I will tell you now we packed more for them for the 2 days than we took abroad for ourselves. With that in mind I thought I would share our checklist for Visiting The Grandparents. Sleepover at Nana and Grandad's! Joe's parents are in their 40's (I know, we both have young parents) so they are still very hands on with the kids as are my parents which definitely helps when it comes to sleepovers. 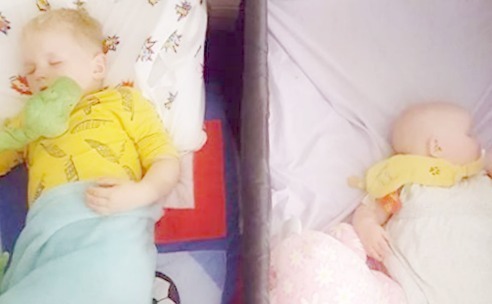 Ted is nearly 5 so pretty much fends for himself but Callie being a baby is that little bit trickier and I wanted to make sure they had everything they could possibly need to make their lives easier for those few days. We were actually able to reduce Callie's down by using the Bumbo as a high chair and place to put her in to play and watch cartoons etc. We have taken our Pop n Jump and rocker chair in the past and honestly for 2 days we just didn't need to take all that stuff. I mentioned food jars. We decided as Joe's parents don't have a lot of experience with feeding babies that it would be easier for them if we just gave them jars of food for the few days we were away. They also eat mostly vegan now so I felt happier knowing Callie was getting the diet she has at home without feeling like we were making them cook with dairy products which they don't agree with. These Hipp organic jars are perfect as they are nutritionally balanced with natural ingredients. Super easy to use and actually really tasty. Callie loves the Creamed Porridge and Banana Yogurt but the fruit ones are 100% fruit and perfect for mixing in to porridge or just as a stand alone snack. I felt happy knowing she was getting healthy food while making feeding her easier for the grandparents. My main advice for leaving the kids with family members is to relax. If you have asked them to take care of your children then it is because you trust them to be capable. If they need anything you have forgotten there is always a shop down the road but making sure you pack wisely will make the experience easier and they will have more time to focus on enjoying time with the grandchildren which is what it is all about! *we were sent some Hipp jars to try but all opinions are our own.